In recent years, the idea that Gulf countries should fully integrate with a European-style Union has been heavily promoted by the Saudis. (AP)—Saudi Arabia and its Gulf Arab neighbors wrapped up a summit meeting in Kuwait on Wednesday by agreeing to establish a joint military command, paving the way for tighter security coordination even as their regional rival Iran pursues outreach efforts in the wake of its interim nuclear deal. The six-member Gulf Cooperation Council also agreed to lay the foundations for a joint Gulf police force and a strategic studies academy, according to a summary of the group's closing statement carried by the official Kuwait News Agency. Taken together, the initiatives suggest that the U.S.-allied Gulf states are seeking to do more to ensure their collective security amid the prospect of warmer relations between Iran and the West. The Islamic Republic agreed last month to freeze parts of its nuclear program in exchange for some relief from Western economic sanctions. Many in the Gulf remain wary of Tehran's intentions. Saudi Arabia in particular sees a stronger Iran as a threat to its own influence, and it and other Gulf states are major backers of the rebels fighting to overthrow Syrian President Bashar Assad, whose government is backed by Iran. The Gulf states have nonetheless voiced at times cautious support for the nuclear deal—a theme they reiterated as a bloc in Wednesday's closing statement. They also welcomed Iran's "new approach" toward the GCC and expressed hope that it would lead to "concrete steps in order to reflect positively on peace, security and stability of the region." U.S. Defense Secretary Chuck Hagel traveled to the Gulf in recent days to reassure longstanding Arab allies. He made clear that the interim nuclear deal does not mean that Washington thinks the security threat posed by Iran is over. Hagel also outlined steps to increase security cooperation in the Gulf region, where the U.S. deploys tens of thousands of air, land and sea forces, and opened the door to sales of missile defense and other weapons systems to the GCC as a bloc. His tour followed visits by Iranian Foreign Minister Mohammad Javad Zarif last week to four of the six Gulf nations in an effort to improve ties. It was not immediately clear when the proposed Gulf military command and joint police force would be formed, how they would be structured or what the extent of their mandates would be. 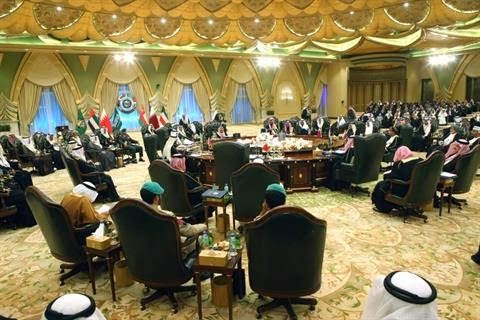 The summit's closing statement said a joint defense council would "take necessary measures to put this agreement into effect," while the joint police force "will boost security and help expand security and anti-terror cooperation and coordination among member states," according to the Kuwaiti news agency. The GCC includes Saudi Arabia, Kuwait, Bahrain, Qatar, Oman and the United Arab Emirates. Saudi Arabia is the bloc's largest economy and traditionally sets the political tone for the region. It has pushed for a closer union among the six nations, and led a Gulf military force that deployed in support of Bahrain's monarchy in March 2011 when it faced down a Shiite-led uprising in the tiny island kingdom. Riyadh's push for greater unity has met resistance, however. Oman's minister responsible for foreign affairs, Yusuf bin Alawi bin Abdullah, announced over the weekend at a security conference in Bahrain that his nation would not participate in any formal union among the Gulf monarchies.